Awesome little boy sitting on beanbag chair and learning to play piano. Talented smiling using toy synthesizer for composer music. Indoors. Childhood. Happiness. 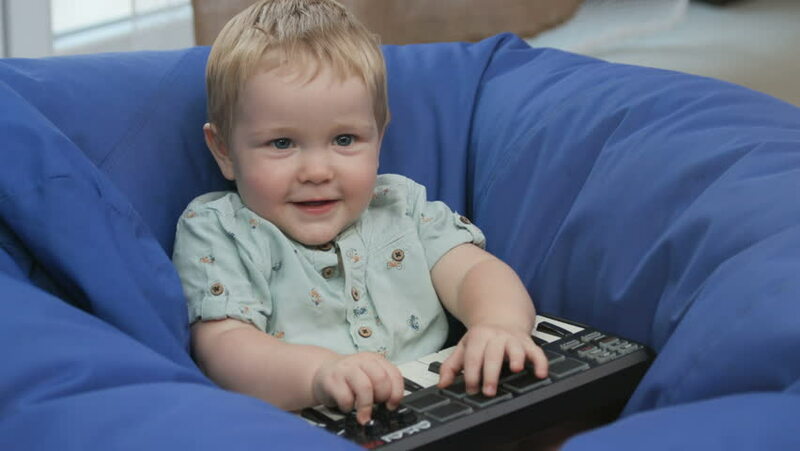 4k00:14Portrait of cute baby sitting on blue bean bag chair and playing toy piano. Focused little child mixing music. Childhood. Daytime. Indoors. 4k00:20Serious and funny Caucasian kid sitting big soft bean bag chair. Portrait of cute Slavic baby playing little toy piano. Indoors. Lifestyle. 4k00:10Playful Caucasian little child with toy synthesizer in hands looking directly at camera and smiling. Pretty Slavic baby sitting on beanbag chair. Happiness. Enjoy. Indoors.